The building represents the integration of a range of medieval styles, from Norman to English Decorated. 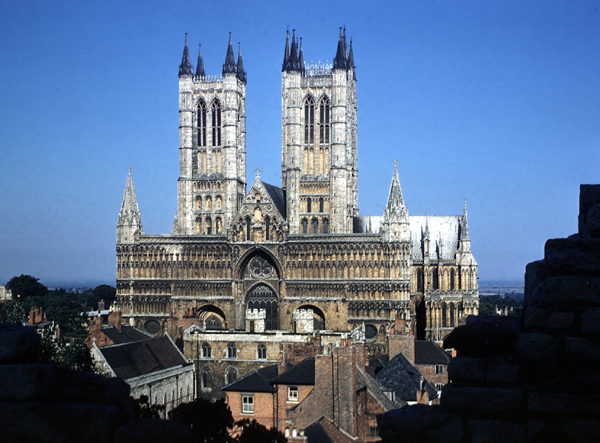 The first Norman Bishop, Remingius, moved the seat of the diocese to Lincoln from Dorchester sometime between 1072 and 1075 and began the cathedral. He died three days before its consecration on May 9, 1092. Roof destroyed by fire in 1141. The bishop at that time, Alexander, made many changes to the west end. The cathedral was used as a stronghold by King Stephen in his war with Queen Matilda, whose supporters , The earls of Lincoln and Chester, had occupied the nearby castle of Lincoln. An earthquake in the year 1185 did extensive damage. In 1186, Henry II named Hugh , son of a Lord of Avalon, near Grenoble to be the bishop of Lincoln. In 1192, he began an extensive renovation of the church, under the direction of architect Geoffrey de Noyers. Hugh was later canonized. Many pilgrims came to Lincoln to visit his relic, which were translated to the new "angel Choir" on October 6, 1280. The central tower fell in 1237 of 1239 (the sources differ as to the exact year), during the episcopate of Bishop Robert Grosseteste. The new nave was completed during his episcopate. The "angel choir" was begun in 1255, but not completed until the early years of the 14th century. Pevsner, Nicholas and John Harris. Lincolnshire. Series: The Buildings of England. London, 1964. Pages 81-139.